If you’ve got sourdough starter in the house, then sourdough waffles — in my opinion — are a MUST. They’re fluffy, light, crispy, slightly chewy, and have a much more complex, but still subtle, flavor than any standard waffle I’ve tried. They take a bit of pre-planning, but they’re worth it. Tip: Because I find that my sourdough waffles are superior when I use an already-activated sourdough sponge, I usually make these when I’ve set an overnight sponge for something else, like bread or pizza dough. Invariably, after I’ve used what I need for the bread and set aside the cup or two of starter to put back in the fridge, there’s an odd amount left in the bowl that I just can’t bring myself to throw out. That’s when I know it’s waffle time. In a large bowl, whisk together the sourdough sponge, flour, sugar, yogurt and milk until fully combined. Cover with a clean tea towel and set in a warm, draft-free place to proof for 8-12 hours. Preheat your waffle iron. Add the melted butter, eggs and vanilla to the proofed waffle batter and mix thoroughly. Stir in the salt and baking soda. 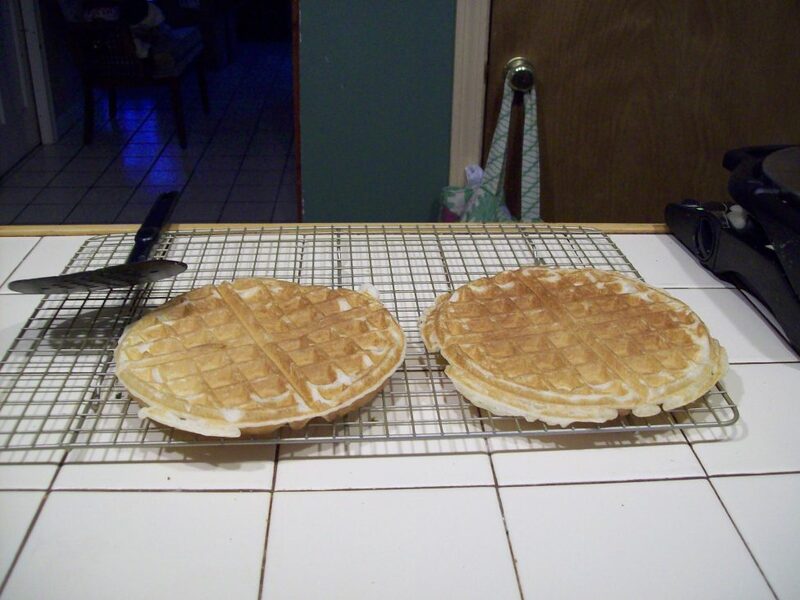 Make the waffles according to your waffle iron’s directions — you should get 12-14 large waffles from this batter. Serve straight off the waffle iron, or set them on a cooling rack to keep them from getting wet and soggy on the bottoms before storing. To revive waffles that have been in the fridge or freezer, a turn in the toaster or oven will make them perfectly crisp and fluffy again. *Activated sourdough sponge is just the sourdough starter that you’ve already mixed with equal amounts of flour and warm water, and let bubble for 8-12 hours to “wake up” the natural yeasts. You go through this step every time you bake with sourdough.